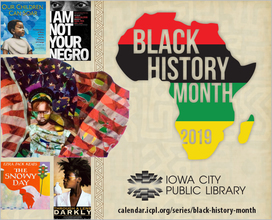 February 2019 | Visit us online at www.icpl.org. Families are faced with many changes after baby arrives, but implementing a daily reading routine doesn’t have to be one of them. The Library recently launched Belly Baby Reads, a new program designed to help families make literacy part of their growing family. 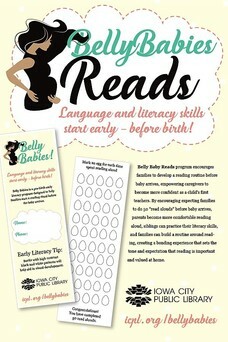 "Belly Baby Reads encourages families to develop a reading routine before baby arrives, empowering caregivers to become more confident as a child’s first teachers," Children's Librarian Karen Gordon says. "By encouraging expecting families to do 50 'read alouds' before baby arrives, parents become more comfortable reading aloud, siblings can practice their literacy skills, and families can build a routine around reading, creating a bonding experience that sets the tone and expectation that reading is important and valued at home." Register now at the Library. Participants will receive a black and white board book at registration, along with a bookmark to track their progress to 50 read aloud books. Turn in the completed bookmark for a second black and white board book. One Book Two Book is an annual celebration of children’s literature in the City of Literature. This year’s special guest is Claudia MeGehee! The celebration begins Friday, Feb. 22, with the City of Literature's Once Upon A Time dinner at Hotel Vetro. This invitation only event celebrates stories written and performed by Iowa City elementary school students. Saturday is the biggest day of the celebration with the Children's Book Fair at Hotel Vetro. Non-stop activities include Author and illustrator, Claudia McGehee, Absolute Science, The National Mississippi River Museum & Aquarium's traveling touch tank, face painting, author readings and signings, Brio and Duplo trains, arts and crafts, and visits from beloved book characters, including the Very Hungry Caterpillar, Clifford, If You Give a Mouse a Cookie and Pout Pout Fish. Find the complete schedule here. Celebrate creative writing by Iowa City elementary school students from 1 to 3 p.m. Sunday, Feb. 24, in Macbride Auditorium on the University of Iowa campus. Join us as we honor black culture and history with books that celebrate key African American figures. Our film fest will feature several important stories that have been made into animated features, including “Voice of Freedom: Fannie Lou Hamer,” “Spirit of the Civil Rights Movement,” “Trombone Shorty,” and “The Snowy Day.” Stop in for one short film or stay for them all. Popcorn will be served. February 11 is set aside for children in the country of Cameroon to rededicate themselves to the importance of nonviolence in their daily lives and strive for education. The African American Museum of Iowa will connect this rededication with the nonviolent efforts of Dr. Martin L. King, Jr. This program is for children in preschool through second grade. Did you know “The Snowy Day” by Ezra Jack Keats was the first mainstream picture book to feature an African American protagonist? Join us as we commemorate “The Snowy Day” through reading, rhymes and songs, short films, an indoor snowball fight, and even playing with tabletop snow. Author/illustrator Bryan Collier is a four-time recipient of a Caldecott Honor for “Martin's Big Words,” “Rosa,” “Dave the Potter,” and “Trombone Shorty.” Collier uses a unique technique of combining watercolors with collage, often using photos or cutouts from magazines. Today we will create custom collage art inspired by Collier’s art. This program is for students in first through sixth grade. Celebrate Black History Month by learning about Garrett Morgan and Dr. Patricia Bath. We'll make paper models of their most famous inventions: traffic lights and eye-healing lasers. Discover the story of Mae C. Jemison, the first African American woman to travel to space, then create constellation embroidery art to take home. This program is for students in third through sixth grade.